Mowaffaq is a commercial/company lawyer and an insurance specialist with more than 40 years experience in insurance and reinsurance through the various executive positions he occupied in the Middle East. With an LL.M. degree from Leeds University, England, and an LL.B. degree from Baghdad University, Mowaffaq is also an admitted lawyer in Iraq. He is a fluent Arabic speaker. Mowaffaq participated in a number of drafting committees of Company/Marine/ Transport laws in the Middle East, the last one being the Commercial Companies Act No. (21) of 2001, Bahrain. He lectured on Company Law, insurance, and reinsurance. He also took part in numerous deliberations with regulatory bodies leading to the establishment of the insurance regulatory regimes in a number of Middle Eastern countries including Iraq, Bahrain and the Kingdom of Saudi Arabia. 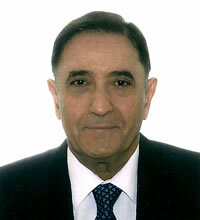 Mowaffaq joined LXL, as a Senior Consultant in 2008.